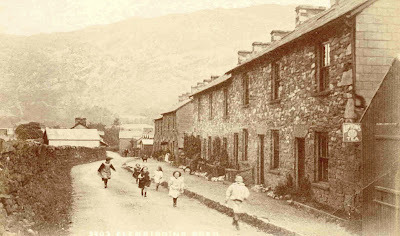 An old postcard with this photograph of St Patrick's Church was found by Fra Cooke. 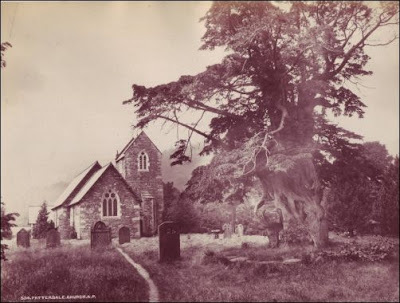 The photograph must have been taken before 1883 because the ancient tree in the foreground is the venerable old Yew Tree which, despite a wall being built around the base to help preserve it, was blown down during a storm in 1883. The tree had great girth and was mentioned as a 'very fine old tree' at the time of the Norman Conquest! 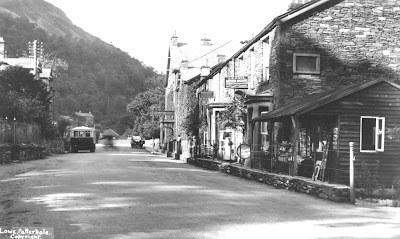 This wonderful picture shows the horse drawn coach (fully loaded) approaching the narrow section of road in front of the White Lion. The village water pump can be seen on the left. 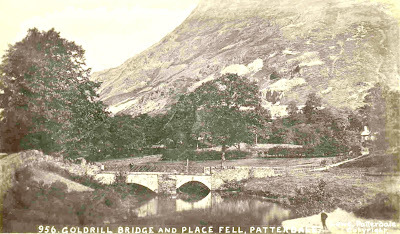 Goldrill Bridge, looking towards Place Fell - c ?? 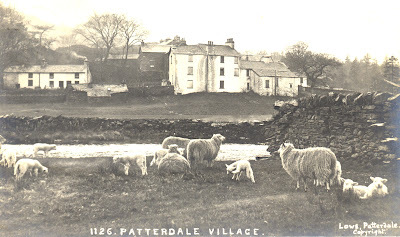 It looks as though this picture was taken before Goldrill Cottage was built. There is even a glimpse of Broad How on the right. 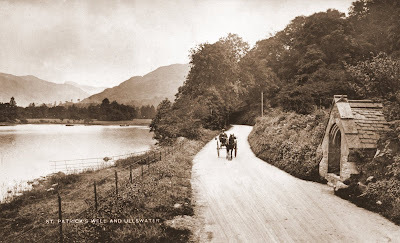 Greenside Road, Glenridding - c ?? Old School House - c ?? 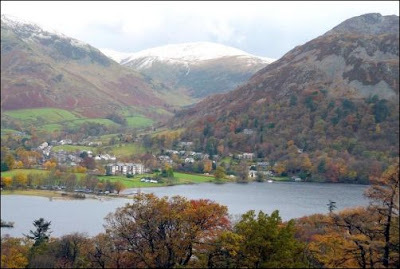 Glenridding from Glenridding Dodd - c ?? The small wooden cabin sold cigarettes, sweets, postcards etc. 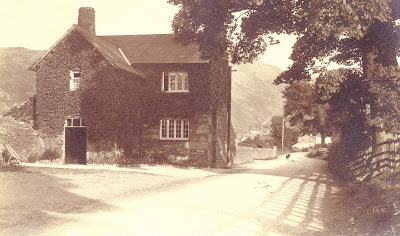 It belonged to the Pool family, who owned the Beech House Tea Shop and Guest House next door. 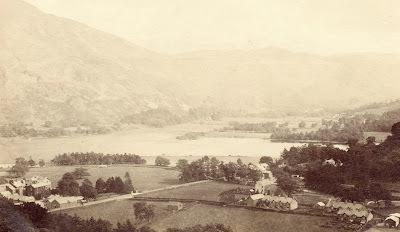 Also on the right are Bridge House and the newly name Glenridding Hotel. 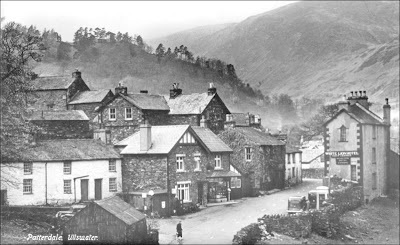 Mill Moss, Patterdale - 19?? 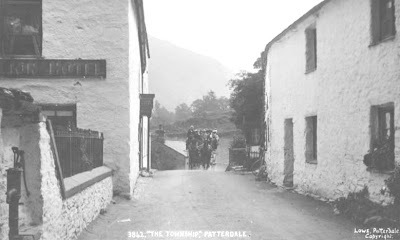 The water in Mill Moss, situated behind the Patterdale Hotel, was controlled by a sluice gate. 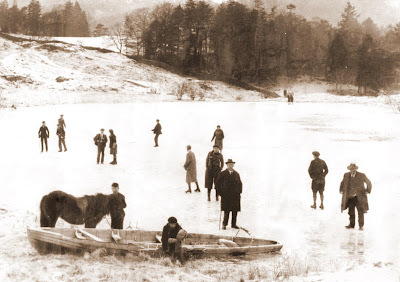 It was therefore quite shallow and perfect for ice-skating. Does anyone know when this picture was taken? 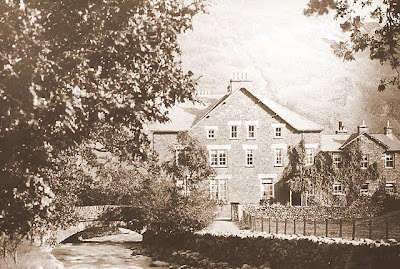 Was there a mill? 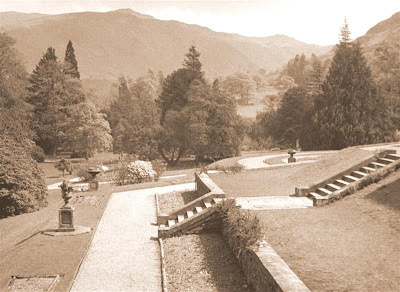 The remains of the base where the old Yew Tree once stood can still be seen. It is hoped that a replacement Yew can be planted at some time. 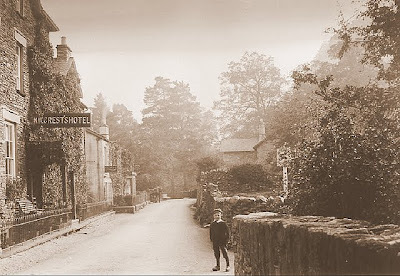 Apart from the Yew Tree and the clock fitted to the tower, very little has changed in the past 127 years - even the 'unofficial' footpath is still there! 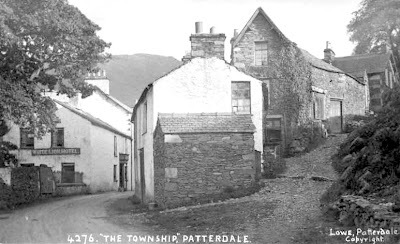 The most visible change is the absence of the cottage that was demolished to widen the road (although it's still pretty narrow at this point). The water pump has long gone but the alcove it was in can still be seen. Wow... how the trees have grown! The lattice railings on the bridge are still there. 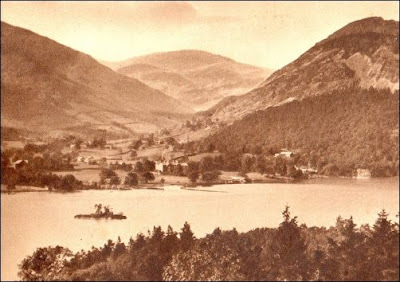 The cabin disappeared long ago - replaced with two flats. Beech House still offers B&B accomodation.